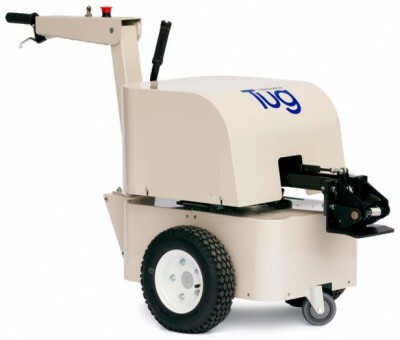 This battery powered tugger is available in 1 and 2 metric ton models. The Tug Evo battery powered tugger can be fitted with an optional lift mechanism for those applications that have wheels on only one side of a cart or material handling equipment. Safe. Simple to use. Intuitive. The Tug Evo pedestrian operated tugger is designed to improve workplace efficiency while nearly eliminating the risk of serious injuries from manually moving heavy or awkward loads. Steering the battery powered mover with the tiller handle allows the operator to walk in front of a load. This reduces strain on the lower back, shoulders, and legs while maximizing forward vision to reduce the possibilities of collisions. The Tug Evo also has an unique feature in the optional lift mechanism. Like Toyota and Boeing, you can increase productivity and safety while reducing operational costs by using the Tug Evo at your facility.